"I know the old man likes you, but that doesn't mean he's gonna set sill for you courting his daughter." As is usually the case I found myself becoming amazingly bored sitting at an airport gate in late 1999. Wondering what I could do to keep the boredom I was feeling from killing me, I walked into the bookshop at O'Hare looking for something to help pass the time. Nothing caught my eye, until I came across Cormac McCarthy's All The Pretty Horses, a novel I read in a short amount of time, and have read many other times sinse. Very few novels define a place in time, or what it is like to be alone with nothing but love and friendship to get you by, as this novel does. Very few book to film transformations come off without a hitch. Most novels are written with such detail and scope that the task of adapting them for the screen often falls well short of recreating the elements that made it successful in written form. 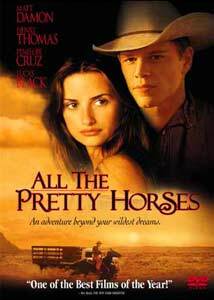 Some adaptations come off beautifully (Fight Club, High Fidelity, The Godfather, etc...) and others stumble horribly (any movie of the week based on a bestseller), All The Pretty Horses not only falls into the first category, it is, in my opinion, one of the best films of 2000. Matt Damon stars as John Grady Cole, a Texas rancher who finds himself lost when his mother sells off the ranch he is to inherit to an oil company. With nothing left for him in San Angelo, he heads south to Mexico with his best friend Lacy Rawlins (Thomas). As John and Lacey near the Mexican border they meet Jimmy Blevins (Black), a young boy whose background is more than a bit shady. After a night in Mexico John and Lacey are set to part ways with Jimmy, but not before they find themselves hunted because of a crime with which they had no part. John and Lacey escape their pursuers and find work on the ranch of Don Hector Rocha y Villareal (Blades), where their abilities with horses keep them in work. Just as things begin to fall into place for Cole, he defies his good luck and falls for Don Hector's beautiful daughter, Alejandra (Cruz). When it rains it pours, and the roof comes off the casa soon after. Unlike most films released that fit into the epic "Big Country" genre, All The Pretty Horses is more concerned about its characters than it is about its vast locations. Director Billy Bob Thornton, obviously a fan of the Cormac McCarthy novel, does a nice job with the romantic subplot between John and Alejandra, allowing us to care about their fate and hope for them to be together no matter what the odds. What is far more impressive is that Thorton's moves the film along tying up loose ends and giving the film its just denouement. The strongest performances in a rich cast belong to its two leads. Both Matt Damon and Henry Thomas create amazingly interesting characters, creating personalities so endearing that we can't help but care for them. Damon isn't my favorite actor in the world, but he's created an art form out of portraying this kind of naïve character, and his abilities pay off in this film. Penelope Cruz does a nice job as Alejandra and her scenes with Damon work for the most part. Supporting roles by Robert Patrick, Lucas Black, Sam Shepard, and Bruce Dern are each note perfect. Image Transfer Review: Films like All The Pretty Horses hardly need help looking more beautiful given their locations and wide scope, but some how the 2.35:1 anamorphic transfer from Columbia Tristar makes the film look even better. The transfer has a soft look at moments that keeps the detail and sharpness from earning high marks, yet the picture isn't hampered a bit. There are moments of pixelation and a few print scratches towards the beginning and middle sections of the film, but, as I said, this film is beautiful to look at and the image on this DVD makes it all the better. Audio Transfer Review: Presented in Dolby Digital 5.1, All The Pretty Horses features a highly active mix that provides some very nice surround moments while not being overly gimmicky. From the opening scene of horses galloping across an open field to the sound of thunder this mix impresses. Dialogue is at times difficult to make out, yet it never becomes unbearable A Dolby 2-channel English mix is also available. Extras Review: Trailers for All About My Mother, Dogma, All The Pretty Horses, and Legends of the Fall are available for viewing. All The Pretty Horses is a terrific film that unfortunately has not gotten the treatment it deserves on DVD. The audio and video portions of the disc are fine, but knowing that there is a longer cut of the film keeps me from recommending it with an overwhelming sense of joy. Do yourself a favor and read Cormac McCarthy's novel and rent the film version. This is a great motion picture, and we can only hope that Columbia Tri Star Home Video will release a special edition in the near future.